On some insignificant morning last December, I stepped into our bathroom with a positive pregnancy test. Stephen peeked out from behind the shower curtain, and I sort of raised my eyebrows and shoulders at him. He kind of chuckled and said, "Really?". At the time, we had an eight month old, and I was being clear with people that we planned to wait until Schroeder was at least potty trained before we added a fourth child to our family. We had plans for 2010. We wanted to move to Portland, and we were willing to go without a job. 2010 was also supposed to be the year when we would take a break and focus on babies that my sister and brother would be welcoming. Unfortunately, I was never able to properly meet my three nephews, Nathaniel, Roanin, and Kade. A fact that quickly brings tears to my eyes. My brother's little Ethiopian expectation has, like most adoptions these days, been delayed until 2011. I think I cried a little that December morning. Our timetable was being changed. Stephen just hugged me and smirked, a little too proud of himself, I think. We were both hoping for a girl, and were excited to find out in the spring that indeed this baby would be wearing pink. We have had the name Teresa Margaret Lucy Williams picked out since we were expecting Julian. We have always hoped that there would be a Maggie Lu joining our family someday, and all of a sudden it didn't seem to matter that she was coming sooner than we had planned. These last few weeks, I've been working on preparing for her birth which is only a month away. This is the first pregnancy that I have not had a baby shower. After three children, I really didn't need much. With the help of my very generous parents, we bought a new double stroller. Can I say that it is hard to get excited about a double stroller? They are no good options. They are all bulky and heavy, but I thought it was necessary since I'll have an infant and a 16 month old not to mention a three year old and a six year old! I took a walk through the local Buy Buy Baby store looking for anything that I wanted or needed, hoping that buying something new just for this baby might help get me more excited for her birth. The amount of STUFF that they have for babies these days is ridiculous! However, I did find a few items that I couldn't live without and wanted for my new little one. 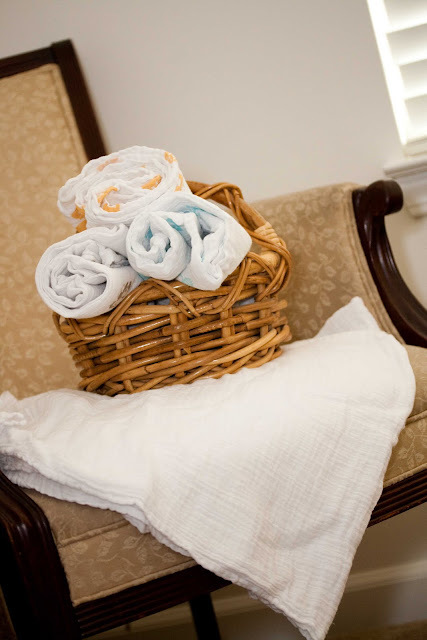 We swaddle our babies when they sleep (read about our burrito method). I was thrilled to find these super cute, thin, and big swaddling blankets. I was always concerned that the blankets we were swaddling with were too heavy and thus hot. Hopefully, they'll be strong enough to keep little hands tucked inside the swaddle which, in my experience, is the secret to a good swaddle. 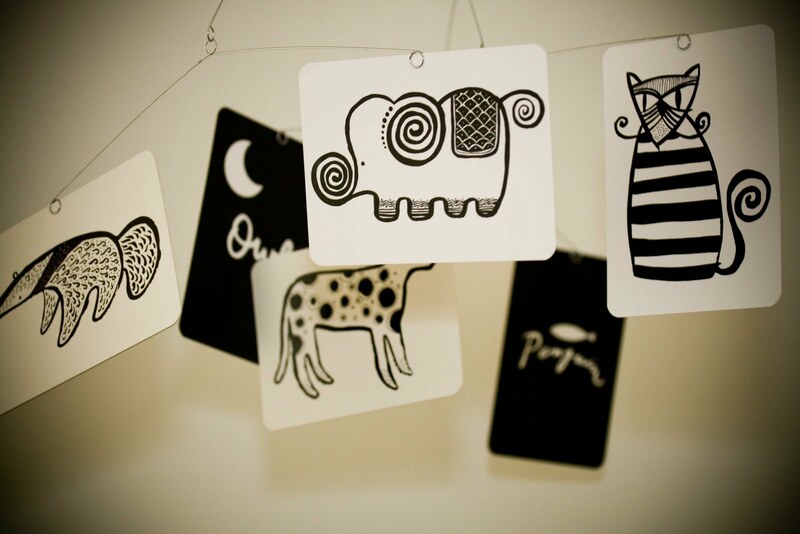 When we were in Chicago, I saw this really fun, modern mobile hanging up in a toy store. When we asked if they carried it, they said they had actually made it using these cards and this mobile. We bought the cards they had in the store, and purchased the mobile on Amazon. With my older children, I've always put this long plastic strip with black and white pictures in their bassinet. Someone asked me about it once, and I told them that I had heard somewhere that very young children were able to see high contrast black and white images very early. So hopefully this mobile which is hanging right above her co-sleeper will get Maggie's brain working early. Besides STUFF (you know, those things you can't take with you when you leave this world), we've been preparing for her delivery. You might remember that Schroeder entered the world in a hot minute (Schroeder's delivery story). Stephen almost had to catch him. Remember I told you that my husband was calm? I will never forget the moment when the midwife asked Stephen to check for Schroeder's head via speaker phone. The "uh..." and face that went along with it are forever priceless to me. He told me later that he wouldn't have been so freaked out if he had been at all prepared. So, this time, he's preparing...just in case. 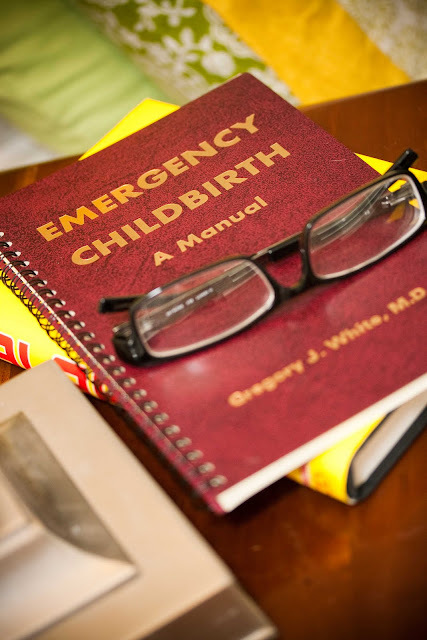 He diligently read Emergency Childbirth, A Manual by Gregory J. White, M.D. The fact that he desires to go with me to all "our" midwife appointments and is willing to read this book to prepare for our babies' birth definitely makes me feel loved. Hopefully our midwife will make it in plenty of time. Hopefully, I'll have enough courage to endure those last few contractions. I've realized how much I'm dreading the transition phase of delivery. I've long since decided, though, that a homebirth is what I want even if an epidural isn't available. If you would like to ask God for a little extra peace for me in the next month, I would be grateful. Lord Jesus. You are the Ultimate provider of perfect peace. You also know about bringing little ones into this world. I pray for Melissa the kind of perfect peace that comes from You. Tilt her ear to Your mouth in a way that she will hear You whisper. Whisper so softly, Father, that it takes her thoughts off of her anxious ones and delivers them into Your perfect peace. Hold her hand tightly. She is Your child and passionately desires to raise her children to love you with all their hearts and know how to run to You always. In Jesus Name, Amen. I will be praying for you, Melissa. I am praying for you my dear friend. As I read your blog, I found myself feeling so much of the same feelings as you. How crazy is this journey we are on? Cannot wait to hear all about how Maggie Lu enters and share with you how Jude arrives, too.